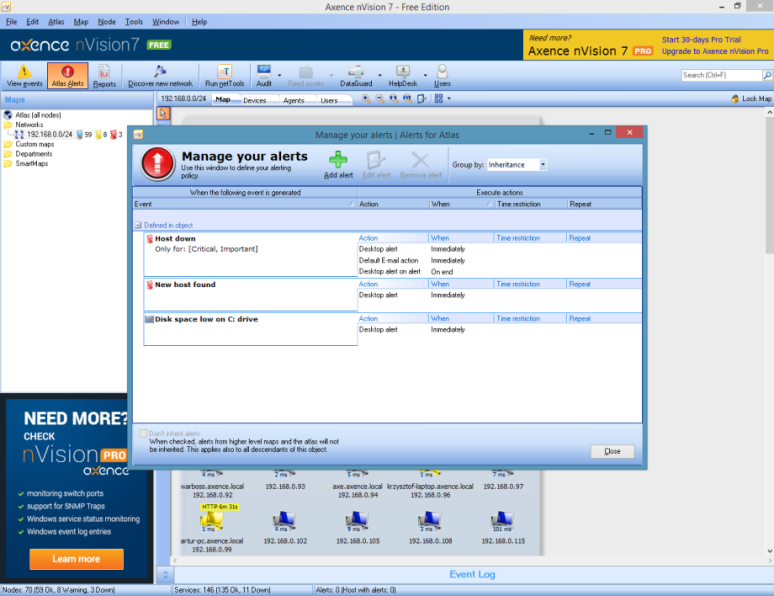 Axence nVision Free offers the mapping and monitoring of an unlimited number of devices and the basic features for users monitoring, inventory taking, helpdesk, and device access control. Network monitoring: -network scanning, detection of devices and TCP/IP services, web access with browser -response time and correctness, packets received/lost statistics (PING, SMB, HTTP, POP3, SNMP, IMAP, SQL, etc.) -CPU load, memory usage, disk usage, network traffic, etc. -file distribution with use of WMI Hardware and software inventory: -list of applications and Windows updates on single workstation (registry) -software serial numbers (keys) -overview of workstation hardware User activity monitoring: -user activity overview -top 10 of visited web pages (number of page visits, with headers, number and duration of visits) Help for network users: -trouble ticket database -creating and managing trouble tickets (assigning to administrators with e-mail notification) -comments, attachments in the trouble tickets Protection against data leaks: -devices currently connected to computers -list of all devices currently connected to the network Language versions: English, German, Spanish, Polish. This site does not contain serial number, crack, keygen Axence nVision Free serial number : serial number is the simplest type of crack. A serial number(cdkey,product key,etc) is register the program as you may already know. a crack or keygen may contain harmful software. If you cannot find the exact version you want, just give it a try. for more information read .nfo/.txt/.diz file include in zipped file.